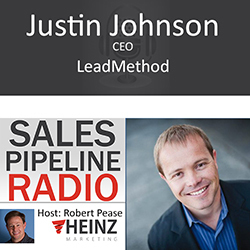 Host, Robert Pease welcomed Justin Johnson, CEO LeadMethod. This is about the challenges and opportunities of a scaled distribution model - through partners, resellers, distributors, outside reps. Some of what LeadMethod tackles is the fundamental challenge unique to channel partners distribution vs. opt in, direct method. To get the critical feedback to better understand who is where in your pipeline. This is a challenge they tackle to add to your efficiency. There are so many different elements that companies are creating in order to come together to collaborate and communicate that sometimes it falls apart. How do you get enough data to draw conclusions on what is actually working with partner networks? It becomes a black hole of information. Engaging the distribution group and collecting the critical feedback --THIS is key. You have to look at why CRMs were built. Understanding what the the customer bought, who they bought it from; and then it morphed into a lead management system. But they take a lot of training. Listen to more of the clarification and reasoning behind channel sales enablement in this episode.